William the Conqueror developed a strategy of quickly building a network of wooden Motte and Bailey Castles - he even bought pre-built castles with him when he invaded England - the Battle of Hastings 1066! His objective for constructing the Motte and Bailey castles was to build a network of defence or a springboard for attack! A Motte and Bailey castle could be erected quickly - some only took a couple of weeks! It is believed that as many as 1000 Medieval Motte and Bailey Castles were built in England by the Normans - the Norman strategy for the control, attack and defence of the conquered nation. When the Normans invaded there were very few English Castles - the English had built fortified towns called Burhs but these acted as a safe retreat for the indigenous population - not a base for control, attack and defence. Hillforts had also been constructed and going even further back in time the Romans had built Roman Forts. The speedy construction of so many Motte and Bailey castles enabled the Normans to totally subjugate the English - the perfect vehicles for control, attack and defence. Motte and Bailey Castle - How to attack? Motte and Bailey Castle - How to defend? 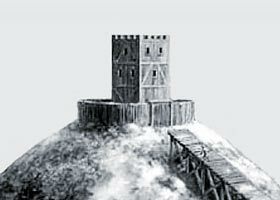 The Motte and Bailey Castle - a network of defence or a springboard for attack! It can be seen that the choice of one of the above locations for a Motte and Bailey castle was critical for the Norman strategy of control, attack and defence! Motte and Bailey Castles - The Problems of the Attack ! Motte and Bailey Castles - Attack Strategy using Fire! One of the forms of attack was fire! The timber buildings in the Bailey and the Tower itself would burn easily under attack. Having breached the Bailey it would be relatively easy to mount an attack and set the buildings on fire. But taking the Tower was another matter! The Anglo-Saxons had no cavalry and very few archers - an essential for a Motte and Bailey castle attack! Their main weapons used by the Anglo-Saxons were the Danish battle-axe (a two-handed, long-handled battle axe with a heavy chopping head) and a long double-edged sword. Spears and slings were also in use. Fire-arrows would have helped but the Tower was on top of the Motte that could be anything between 50 to 120 feet in height - the range of an arrow was about 90 feet. Huge problem! Hardly any archers and the longbow had not been invented at this time! The English weapons were cumbersome - imagine trying to climb up a really steep, slippery Motte holding a heavy battle axe and a shield with a barrage of arrows and stones raining down on you! Motte and Bailey Castles - Attack - Siege Strategy! It now becomes very clear why the Norman strategy of building Motte and Bailey castles was so successful - and why the Norman Invasion force of between 5000 and 10,000 maintained their dominance over the whole of the Anglo-Saxon population after winning the Battle of Hastings! Motte and Bailey Castles - Defence Strategy! The Motte and Bailey Castles Attack & Defence were used as a fortified post for the Calvary to keep order in the surrounding areas. The castles were intended to intimidate the local population - just the appearance of such a structure resulted in capitulation by the local population. Should a castle be attacked the success in defending the Motte and Bailey Castles depended on how well the castle had been built - the height and the building materials. Their weapons - the number of arrows and the number of soldiers as opposed to the attacking force. Whether the Motte and Bailey Castle could withstand a siege - was there enough food and was there a supply of fresh water? So started the strategy of the Normans to build castles as their source of power in England. They initiated a programme of constructing more and more - it is believed that nearly one thousand Motte and Bailey Castles were built which were used by the Normans to totally subjugate the English and the Welsh. The scenes illustrated on the Bayeux tapestry, celebrating the Norman victory at the Battle of Hastings, and the eye witness accounts of the chroniclers has provided us with a vast amount of information about the Motte and Bailey castles. We recommend the following site for further details: The Battle of Hastings - 1066. The wooden Motte and Bailey Castles were gradually improved even further and the great fortresses of Medieval England - the great Norman Medieval stone Castles were built.